Patch 6.1 arrives today, bringing a number of changes. I’ll try to keep this short (ha!) and just hit the points that matter to us. Glyph of Harsh Words is now only available to Holy Paladins. If you haven’t been following the prot DPS scene, you may not know that we were doing a lot of damage in early January. We got hit with a series of nerfs to help rein that in, including a nerf to Seraphim (down from 1000 of each stat to 750 for prot), collateral damage from a giant 80% nerf to Seal of Truth (see below), and a nerf to the Alabaster Shield glyph (from 10% per stack to 3%). Harsh Words, while it wasn’t nerfed, was also a contributing factor. Harsh Word does a fair bit more damage than Shield of the Righteous, so this glyph was a pretty significant DPS gain. Of course, the downside is that you give up a lot of defense by using it. That’s a pretty fair trade-off, but it did lead to a lot of high-DPS parses in early Highmaul that ruffled the feathers of pure DPS classes. In 6.1, both of these glyphs are off the table for Prot. That said, I don’t think either of these removals were actually targeted at reducing our DPS. 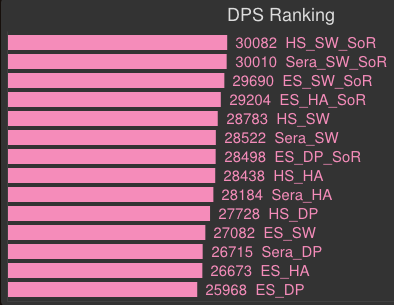 High-DPS parses generally rely on stacking of Holy Avenger and Seraphim with potions, trinkets, and a lucky streak of Avenger’s Shield procs (ideally an AoE situation for maximum damage). Both glyphs obviously help, but they’re small effects in a relative sense. What was the point of these removals, then? Choice. Your average paladin had quite a few glyph options for DPS: Alabaster Shield, Final Wrath, Harsh Word, and situational glyphs like Focused Shield and Double Jeopardy. Since many encounters favor the Glyph of Divine Protection, we really didn’t get a chance to use many other utility glyphs. There was no room for convenience or play style glyphs like Consecrator or Judgment. In a sense, it’s the same problem that we had with the old talent trees (and arguably, some choices in the new ones) – it gave the illusion of choice rather than a real choice. I think the more important issue is that it made Glyphs feel like a checklist rather than something you could use to customize your play. Removing some of the DPS options helps provide room for more individual choices. Empowered Seals (Protection, Retribution) has been improved. Liadrin’s Righteousness now increases haste by 20% (up from 15%). Uther’s Insight now heals the Paladin for 2% of maximum health every 3 seconds (up from 1% every 2 seconds). Seal of Truth is no longer available to Protection Paladins. Seal of Command is now replaced by Seal of Righteousness instead of Seal of Truth. Empowered Seals is getting a buff this patch, since it was lagging significantly behind the other two options. I’ve included the removal of Seal of Truth in this section because Empowered Seals is the real reason Truth is gone. The initial speculation when Seal of Truth was nerfed by 80% via a hotfix was that it was a nerf targeted at reducing our DPS. But that’s really not the case – the DPS loss was at best collateral damage. The real reason was that it was a precursor to the removal of the spell. They can’t remove a spell from the game via a hotfix; that requires a patch. They can, however, nerf it to the ground so that it’s not attractive. Empowered Seals suffered from a case of “too much complexity, too little fun” for Protection. Retribution only has to juggle two seals, which is pretty reasonable and led to a play style that many Rets actually enjoy. But juggling three seals was a bit too much, both in terms of buff management and GCD requirements. The harsher GCD requirement meant you were casting fewer of your rotational spells, of which we already have a pretty full complement. So you were constantly skipping things like Consecration and Holy Wrath to swap seals. A lot of people found that to be less satisfying than hitting an actual damage spell. But regardless of whether you agree with the “fun” argument, there’s a more fundamental problem with the GCD cost of the pre-6.1 version of Empowered Seals. Spending that many GCDs on seal swaps carried a fairly large opportunity cost, both in terms of damage (obvious) and survivability (harder to refresh SS at optimal times). That meant that the buffs needed to be very strong to compensate for that loss. At the existing tuning, the talent was about right (actually a little bit low) for Ret, but far too weak for Prot given the amount of effort. There were several ways to fix that, of course. They could make the buffs stronger for Protection, much like they made Seraphim weaker for us. They could also take seals off of the GCD, but that introduces its own issues, because you could write a macro that made the talent essentially passive. They could re-design the talent entirely, but (a) that’s a lot of work, and (b) they like the theme, just not the numbers. The solution they went with was to axe Seal of Truth for Prot and buff Liadrin’s Righteousness and Uther’s Insight. Since we like haste a lot more than Ret does, the buff to Liadrin’s Righteousness helps the talent much more for us than it does Ret. And obviously, the buff to Uther’s Insight only affects us, since Ret won’t be caught dead using Seal of Insight. Only having to juggle two seals brings the complexity requirement down to a reasonable level. for both specs. Outside of its effect on Empowered Seals, Seal of Truth’s removal doesn’t affect us very much, since we can use Seal of Righteousness for DPS in pretty much any situation we might’ve wanted Seal of Truth before. The one downside to the new implementation is that Liadrin’s Righteousness is giving a lot of haste now. In Mythic BRF gear we can easily hit the 50% haste cap with it active, which makes our stat choices a little wonky. For example, haste proc effects become significantly less valuable, and depending on exactly what gear we have, we may end up enchanting something other than haste or using a different food. This means we’ll be dancing around another cap when it comes to our gearing. As you can see, it only takes 1319 haste rating from gear to hit 50% haste with Empowered Seals and the 5% haste raid buff. That’s not a difficult threshold to hit, and may even be attainable with an ideal set of heroic BRF gear. Twist Insight and Righteousness, trying to keep both buffs up over 90% of the time. Sitting in Seal of Righteousness is clearly the best choice for DPS, netting you around 2.5k-3k additional DPS. At the same time, it’s still a noticeable loss of survival, so it may not be a great idea for progression. At the other end of the spectrum, sitting in SoI is only a minor improvement over twisting, but comes with a significant DPS loss. Twisting is clearly the best strategy for trying to optimize both DPS and Survival, which is probably good since that’s what the talent is trying to encourage. The next question, of course, is how this compares to the other talents. So let’s see how that comparison shakes out. I’ll include all of the regular setups, as well as a few setups where we sit in Seal of Righteousness to attain higher DPS. DPS rankings for all L100+L75 talent combos, plus some SoR ES cases. TMI rankings for all L100+L75 talent combos, plus some SoR ES cases. These plots take a little more analysis than the previous ones. At first glance, you might conclude that Empowered Seals is still terrible. First of all, in the survival arena, it’s pretty competitive with HS and Seraphim. HS has a slight edge thanks to set bonuses, and Sera lags slightly, but it’s a small enough difference in each direction that any of the three talents is a reasonable choice. In practice, you’d probably choose the talent based on encounter constraints like tank swaps and the cooldown on dangerous abilities. Swapping to Seal of Righteousness hurts all of the setups, but appears to hurt Empowered Seals the least. 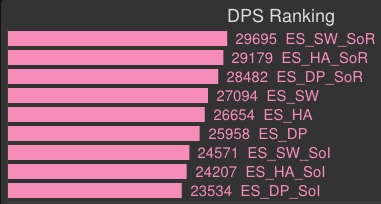 On the DPS side, Empowered Seals seems to be lagging the others by a fair bit. However, this sim over-values Holy Shield in two ways: the actors have 100% active time with the boss, and there’s a ticking DoT that can trigger it every two seconds. If there’s an encounter where you’re tanking the boss continuously from beginning to end, then these results are fairly representative (they should, for example, be a fairly good indication of how Mythic Butcher would work in T17M BRF gear). They’ll still over-value Holy Shield slightly though thanks to the DoT. If you have tank swaps, and assume you only have the boss’ attention 50% of the time, Holy Shield loses about half of its procs. That’s a loss of around 2k DPS, which would drop it back into the same range as Empowered Seals. Factor in the inflation due to pocs from DoT ticks and it will come out a little lower still. In practice, that means Seraphim has a solid lead in DPS for the average encounter. However, if you’re going all-out DPS and using Seal of Righteousness, Empowered Seals is not far behind at all. And as we discussed earlier, that DPS comes with a smaller cost in survivability. The other advantage is that we have more control over when we go into DPS mode and when we go into turtle mode, unlike Seraphim’s fixed 30-second cycle. Holy Shield brings up the rear for DPS, but has the best survival under most circumstances thanks to the fairly powerful T17 set bonuses (more on that below). It’s still a solid contender though, and will remain strong in fights where you’re tanking full time and/or you can abuse the spell and DoT blocking mechanics. This change has really given us three solid options in the L100 talent tier. They all have strengths and weaknesses, but none are so far ahead or so far behind as to be irrelevant. I think Seraphim will still remain the preferred choice at the top tier of Mythic raiders, while Holy Shield will still be the preferred choice for the average player, but the gap has narrowed enough that I think all three talents will see use going forward. I haven’t had time to post since Blackrock Foundry came out, so we should probably talk about set bonuses. First of all, the set bonuses are good, so you’ll want to pick up set items. Unlike previous tiers, set items can be warforged or socketed, so there’s no inherent disadvantage to using 4-piece on paper. In fact, the only remaining opportunity cost in theory is the itemization of the pieces themselves. Of course, in practice you’ll still have to decide between the items you have on hand. So you may still find yourself deciding between a well-itemized warforged/socket off-set piece and a tier piece with neither of those features. Likewise, it’s hard to nail down which four pieces you should aim for because it depends very heavily on what items you have. Legs are the weakest tier piece on paper, but if you have a warforged/socketed off-set option in one of the other four slots then you may be better off using the tier legs to take advantage of that piece. First, let’s look at how valuable the bonuses are. In this sim, I compare an actor with both set bonuses (DP_HS_4p) to one where the 4-piece is artificially disabled (DP_HS_2p) and one where both set bonuses are artificially disabled (DP_HS_0p). I repeat for an actor with the HA_Sera talent combination to see how it affects Seraphim. TMI rankings for set bonuses. Neither set bonus really affects your DPS with Seraphim, but Holy Shield obviously benefits from the extra block granted by Faith Barricade. The four piece bonus (Defender of the Light) doesn’t directly affect DPS at all. The small discrepancy in the DP_HS actor appears to be a combination of statistical fluctuation and a ~1% reduction in Mark of Blackrock uptime caused by larger blocks. On the other hand, both set bonuses are significant for survival regardless of talent choice. An improvement of 2k TMI will be better than swapping to two equal-ilvl items with better secondary stats, so there’s no reason not to grab the set bonuses. DPS rankings for gear sets that trade ilvl for set bonuses. DPS ranking for gear sets that trade ilvl for set bonuses. The set bonuses are strong enough to make up for the loss of 5 ilvls in four slots if you’re using Holy Shield, so grabbing four pieces of heroic tier gear is a no-brainer. With Seraphim the story is a little different. 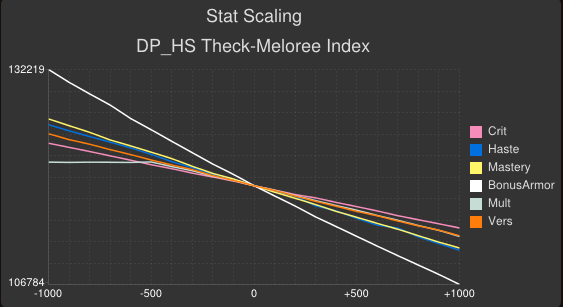 Downgrading to pick up the two-piece improves survivability, although the improvement in DPS is minimal. The four-piece bonus doesn’t quite make up for the ilvl loss though, and comes with a heftier DPS cost. So it’s worth downgrading to get the 2-piece bonus if you run Seraphim, but I would wait to pick up the 4-piece until you get at least a sidegrade in base item power, like a heroic warforged or socketed tier piece. One question that’s come up a lot is how Mythic BRF gear affects stat weights. I set up a sim that uses the T17M gear set with a few different talent combinations to investigate that question. TMI scaling plot for Divine Purpose + Holy Shield. Remember that on one of these plots, the steeper (i.e. more negative) the slope, the better that stat is at increasing your survival. Bonus armor is clearly still king, with haste and mastery roughly tied in effectiveness. Mastery’s getting a bump from the set bonus, which may even make it slightly preferred over haste. Versatility, crit, and multistrike trail the other stats in effectiveness. TMI scaling plot for Holy Avenger + Seraphim. Haste’s all over the map here thanks to the myriad of haste breakpoints Seraphim creates. In practice, I think we should be averaging over those effects to account for latency and player error. That would put haste somewhere between bonus armor and the pack of other stats. The set bonus isn’t helping mastery as much in this talent configuration, so it sits at the back of the pack with, of all things, crit. I’m not sure why crit has lost its dominance with Seraphim here, but that may be due to the choice of Holy Avenger as a L90 talent. Crit may fare better when you pair Seraphim with Sanctified Wrath or Divine Purpose. Tough to say, but it’s something I’ll be investigating in the next few weeks as I have time. TMI scaling plot with Divine Purpose and Empowered Seals. Haste performs incredibly poorly with Empowered Seals because we’re bumping up against the 50% haste cap. As you remove haste (going to the left on the plot), you can see haste’s value increase, but if you add haste above the cap (going to the right on the plot) it falls back in line with multistrike and crit. The standout winner here is mastery though, which seems to dominate when Empowered Seals is selected. Presumably the 91% uptime on Shield of the Righteous we get with this much haste is inflating the value of mastery’s contribution to SotR mitigation. Note that “to 50%” is after all raid buffs and Liadrin’s Righteousness. If you want a target to hit on the character sheet, you want to aim for 1719 rating without raid buffs, or around 19.1%. Hand of Purity now reduces damage taken by 15% (up from 10%). A small buff to Hand of Purity makes it a little more effective against normal (non-DoT) damage. It also makes it a little more competitive with our default choice, Unbreakable Spirit. Thinking solely of Divine Protection and Hand of Purity for the moment, choosing Unbreakable Spirit gives you 16 seconds of 20% mitigation (or 40% against magic) every minute, while choosing Hand of Purity gives you 8 seconds of 20%(or 40%) mitigation and 12 seconds of 15% mitigation. Hand of Purity actually lets you cover more seconds of combat with a cooldown, albeit weaker ones. You could definitely imagine taking it to be able to chain cooldowns through a dangerous phase in an encounter, even if you can’t make use of Purity’s 80% mitigation against DoT damage. That said, I think the fringe benefits of Unbreakable Spirit are hard to pass up. A 5-minute Lay on Hands and a 2.5-minute Divine Shield are really nice, and give you a lot of flexibility in dealing with encounter mechanics. That’s arguably stronger than 4 extra seconds of (weak) cooldown coverage every minute. Still, I think having more options is better in this case, so a buff to make Purity a more viable competitor to Unbreakable Spirit is certainly welcome. And at any rate, it’s a flat-out buff any time you receive it from a Ret or Holy paladin as an external cooldown. Execution Sentence healing dealt by Stay of Execution has increased by 100%. This buff may be targeted at Holy more than Prot. From our perspective, it looks like a buff that tries to make Execution Sentence a more interesting choice as a survival cooldown. The massive up-front healing from the first tick of Stay of Execution would quickly stabilize your health (if not top you off entirely), and the declining HoT gives you a few additional seconds of safety. The real downside of using it this way is the sheer DPS cost. Regardless of which level 90 talent you use, they’re all a large portion of your DPS – 5% or more, in general. That’s a lot of DPS to give up to use Stay of Execution as a survival cooldown, especially when we already have serviceable alternatives in Lay on Hands and Word of Glory. I’m sort of on the fence about this one. A 1-minute sort-of-LoH with a HoT sounds nice, but I’m skeptical that it’s worth the sheer DPS cost. I’ll have to play with it some to see how it feels, since this is the sort of thing that’s hard to quantify in a sim. Still, no sense complaining about a buff. All heals you receive, including multistrikes, have two chances equal to your multistrike chance to trigger Shining Protector, healing you for an additional 30% of the triggering heal. Log showing Shining Protector giving two procs from a single heal. In this example, which was taken some time during Highmaul progression, I received two Shining Protector procs from the initial Lifebloom tick and one proc from the Lifebloom tick’s multistrike. In fact, you could see up to nine healing events from a single heal if you got lucky: the base heal, two multistrikes, and two shining protector procs from each of those three events. I was initially modeling this incorrectly in Simulationcraft based on the tooltip wording and testing I had performed early on in beta (at which point, it was only making one multistrike roll). When I noticed this, I reported the disconnect between tooltip and behavior and received confirmation that it was working as intended, which is what led to the tooltip update we see today. And of course, I’ve since updated SimC to handle the mechanic properly, so all of the sims in this post are modeling it correctly (hence why multistrike is performing a little better than before). So, in short – the Shining Protector change is a tooltip update and not a buff. I haven’t had time to make and upload a video, but I’ve been updating my WeakAura strings throughout the last few months. The base package contains auras to help you manage Seraphim, and I’ve added a separate group to help manage Empowered Seals. I’ve also added armor potions and healing tonics to the cooldowns group. As usual, if you have any questions feel free to drop them in the comments. I’ll try to follow up with and answer as many as I can throughout the day on Tuesday. This entry was posted in Simcraft, Simulation, Tanking, Theck's Pounding Headaches, Theorycrafting and tagged Holy Shield, Min/Max, raiding, rotations, Scaling, simcraft, tank, tanking, theck, Theorycraft, theorycrafting, TMI, warcraft, WoW. Bookmark the permalink. 53 Responses to Patch 6.1 – How Do I Protection? Thanks for the informative post, as always. One question that I still have regarding changes coming in 6.1 is the buff to tertiary stats. Would it potentially be worth now to use an item with Leech or Avoidance over an item with a socket, especially in a slot with bigger stat budget? My initial guess would be no, but I’d like another opinion on it. Not likely. the tertiary stats were very, very weak initially. Even a 300% buff shouldn’t bring them up to the level of a socket. Loving the EmpSeals weak auras! One question: I see that you prioritize switching to SoI if Uther’s Insight is down OR has <6 seconds left, while switching to SoR is only the priority if Liadrin's Righteousness is down. Any reason why? Just to prioritize the healing over the Haste for a survivability gain? Losing over 20% Haste suddenly feels very clunky, and I'd prefer to always refresh it before it falls off (probably slot it in below HP generators like SS). Oh, I just realized it’s because it’s a HoT and with the Pandemic effect you can refresh it in the last 6. Is refreshing either seal when it’s down worth prioritizing over Holy Power Generators, or better to slot in below them, like SS? Yeah, the auras put SoR ahead of HPGs if Liadrin’s Righteousness falls off. You should see one set of SoI/SoR auras to the left of SotR – those are the “refresh this immediately” ones. There’s another set at the far right side to remind you to swap in an empty GCD. I haven’t thoroughly re-checked the order since SoT was removed, but during beta I ran an exhaustive set of tests to figure out optimal refresh strategies. The one that emerged as the strongest was refreshing SoI early (because of the Pandemic effect) but letting SoR fall off before refreshing. I agree it feels weird, but I understand why it’s optimal – it wastes less of the fixed 20-second duration. In practice, it may be better to set the “immediately” SoR aura to turn on when there’s a few seconds left on the buff. That way you know it’s coming and can plan ahead a little. I suspect that would be close enough to optimal, perhaps even completely optimal once you consider the factors of reaction time and player attention. Gotta say I’m looking forward to some seal twisting for Mythic Progression. I’m in a combination of Mythic Highmaul gear and Heroic BRF gear, currently sitting at ~1800 Haste. Actually finding 500 Haste to drop is going to be a little bit of a challenge. Hey Theck, thanks for the post. Do you have updated stat values for ask Mr Robot? Bonus Armor is 1.0 in all of those sets, and Haste’s value after reaching the 50% cap is 0.39 in all of those sets. After reading the article I went on to slap the target dummy with Empowered Seals to get a feel on the Emp Seal weakauras and the seal twisting timing with SS refresh etc. What I noticed though (and why I’m writing this comment) when I checked my character sheet, I noticed my haste % looked a bit weird, considering Emp Seal’s 20% buff. As you can see the gain increases as my haste increased and EmpSeals only provides the flat 20% if the character has 0 haste to begin with. I didn’t work any math further than that as I have little clue what to look for, so I’d leave the mathy part to you if there’s any further inquiry into my findings. My question is: are we seeing Sacred Duty messing around with haste provided by EmpSeals? If so, could this change how valuable EmpSeals is compared to other talents in the row? Hi, love reading your posts, especially the simc ones. I recently started http://wowsimcraft.com and while so far I’m quite happy with it, what I really want is to be able to support tanks and healers. With that said, first i need to know what is really needed from tanks. I’d love to hear your views on what the important parts of tank simming are, and what you really get out of each report. So yea, if you have time, reply here or flick me an email. I’d be extremely greatful. For the most part, I only look at DPS and TMI when simming tanks. That’s the most direct measure of how spiky the tank’s damage intake will be. DTPS and HPS are mostly useless. But a TMI value is only really useful in comparison under similar circumstances. For example, running the sim twice in two different gear sets or with two different talent configurations to see which one performs better. Comparing a Paladin’s TMI to a Death Knight’s TMI is fairly useless for a variety of reasons (including the fact that the two class modules are not equally well-maintained). You can also look at things like expected SotR or Seraphim uptime to see what to expect as an upper-bound in-game. But that’s usually going to be off by a fair bit due to encounter mechanics (unless you’re really fighting Patchwerk). The real value is calculating TMI stat weights, but it appears your site doesn’t do that yet. And even that is tricky due to violations in local linearity (especially with haste), at least until I get time to code a more robust stat weight algorithm into SimC. One thing I seen on Final Boss prot paladin episode a few weeks ago made me start thinking. Our 1st tier of talents, 2 of them scale with haste. Long Arm of the Law gets better with more haste for more up time. I started thinking, is this the same for pursuit of justice? Maybe or one thing I thought about is maybe haste hurts it? The fast u get holy power capped the faster you use ShotR… meaning less buffed pursuit of justice? Not than any of this matters. More of a stay thought I had. Maybe this will interest you to try out or maybe it’s just a waste of thought lol. Pursuit of Justice should be fairly invariant with respect to haste. Haste makes you generate holy power faster, but you will also be spending it faster as a result. So the average uptime of PoJ should be basically the same (and close to 4 or 5 if you’re pooling properly). Speed of Light shouldn’t scale with haste at all. Long Arm of the Law is the only one that does scale with haste, so you’ll have higher average uptime. That said, I’m still not a huge fan of it because it dynamically changes your run speed, which I find jarring. PoJ does the same thing, but with a much smaller magnitude, so you don’t notice it as much. I’d much rather have the (mostly) static effect from PoJ or the on-demand effect of Speed of Light than have to worry about delaying a holy power generator to make sure I have a run speed buff when I need it. Hey theck I was wondering if there was any way to see the TMI/DPS chart for different setups based on bosses? I change of course based on what fits my needs and the raids but I would like to see the most optimal and able to adapt to whatever changes I need. Or if that is too much maybe just a basic ones that you can just use for all upcoming raids as well like, 1 boss 50% uptime on boss, 2 bosses 100% uptime, 1 boss with small adds 75% uptime and more hits, and any other types that you can think of. Sure, but it takes time to set up and run those simulations, and there are some complications. First, there’s the question of what’s really important – for example, how often are you actually tanking 2 bosses 100% of the time? Is that significantly different than a single boss that hits you twice as hard? Unless you mean that you’re only tanking one boss and getting cleave damage on a second, in which case it’s the same as a single boss sim as far as survivability is concerned. The major situations that make sense to me are (a) Patchwerk, (b) Patchwerk + adds, (c) many adds. That more or less covers the easy situations, and you can interpolate from there to estimate what a fight composed of multiple different phases of those three situations would be like. The 50% uptime on a boss one is tricky because it requires a little more work. First, you’d probably want to set it up as a taunt simulation, so you’d code two tanks and add taunts to the APL. Then you’d have to decide how you want the tanks to play. For example, do you adjust the APL for those tanks so that they save cooldowns (Seraphim, HA) while not tanking so that they have higher effectiveness for TMI? Or do you want them to blow those cooldowns immediately as available for maximum DPS? You could also deviate from a Patchwerk encounter by adding light or heavy movement (though in my opinion this is mostly irrelevant for tanking). I think the answer is that you’ll use EmpS if you like that play style better than Holy Shield. It could also be useful on fights that have frequent burn periods which don’t sync up well with Seraphim. In any event, the goal of buffing it was to make it viable for players who like the play style, not to make it mandatory in any situation. I wasn’t aware of healing threat changes in this patch, but they’ll likely be irrelevant in most circumstances. They may affect our ability to automatically aggro stuff with our self-healing, but that’s sort of cheesy anyway. We have enough ranged sources of damage (including Consecration and Light’s Hammer) that add pickup is one of our strong areas even without healing threat. Thanks for all of the information! I have a quick questions. I assume Holy Shield is still the go-to for AoE fights? Or are they all still comparable? I personally like Emp Seals a lot, but still use HS for any fight with 2+ attackers. Depends a lot on the details, but Seraphim is usually higher DPS in AoE situations because of how beastly it makes Avenger’s Shield. If it’s many adds (like >5) that live a very long time (longer than Seraphim buff) then Holy Shield should start pulling ahead. I apologize, I meant defensively. Not from a DPS perspective. I think Holy Shield is more defensive under pretty much all circumstances once you have the 4-piece bonus. But I’d have to run some sims to see for sure. Hey Theck; just a quick comment on the Stay of Execution Buff. I use, and have used since release, Stay as my lvl 90 talent primarily because of the heal. Before the buff it was enough to get me nearly three quarters of my health pool when I used it on myself. With using it while Sera was up I was generally seeing healing in the 110-120% health pool levels over the course of the spell. So far it seems to have worked well for me. Sounds bad due to over healing but with communicating with my healer team (which I’ve been running with for years) my over healing is usually less than 25%, and I try to use it only when I’ve taken a big hit. The only issue I’ve run in to consistently is having to hold the CD for the healing, using it as another survival CD, or planning out the fight so I know when it is safe to use it as a DPS CD and when I’ll need it for the heal. I’m sure this means my dps is lower than those who just use it as a DPS CD but I raid with a friend/family guild so we don’t push that kinda thing anyway. Most fights I pre-pot then use it as a DPS CD then take a wait and see the rest of the fight, unless I know there is a large burst of damage coming predictably in the fight. Only downside i see is that you generize the talent choices to HA with Seraphim, and DP with Holyshield, and in your simulation sheets you dont post results for lets say DP_Sera with i would like to see in the future. DP_Sera is weak which is why its not included, you are handicapping yourself. DP only procs off SOTR and WoG, so everytime you cast Sera you are losing out in DP. 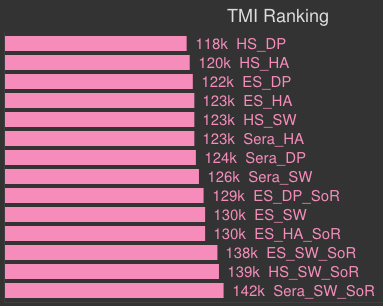 HA is a much better talent with Sera, DPS/TMI. SW is usually the middle ground for both Sera and HS. SW is great for add fights. Quick question for you now since our Haste levels now change gear preferences. Where do you rank the Battering Talisman, now that we can attain 50% haste via Empowered Seals? I’m leaning towards Mastery/Bonus Armor trinkets at this point. Dynamic haste effects (especially on-proc ones, less so for on-use ones) were often a dubious gain in the first place. But yeah, I think a lot of people are less enthusiastic about Battering Talisman now since that proc is far less useful if you’re running Empowered Seals. That said, it’s still a good chunk of stamina (though Pillar of the Earth is probably preferable unless you get lucky with warforged/sockets). Did you find out already why crit was so low in all sims on this post? Could it be because of that 2s ticking damage always up? That can’t be parried and maybe takes off some of the defensive purpose of crit compared to the other stats in this scenario. This was the thing that surprised me the most from this post. Crit was always close to mastery before in my sims and those of others. The 2-second ticking damage was always up in earlier sims too, that hasn’t changed. In the past, crit has only ever really been competitive for Seraphim configurations. I suspect the drop is a combination of set bonuses improving mastery, bugfixes in the model that improved the value of multistrike, and increased DR on parry (because we have more of it in higher-ilvl gear). How does the 6.1 upgrade to Knight’s Badge compare to the previous trinkets? I seem to remember the 670 version holding up quite well, would the 680 be worth considering compared to BRF HC/Mythic trinkets? It’s very likely. I wasn’t able to sim it because I couldn’t find the proper bonus id for that version last time I ran the trinket sim. Looks like it’s pretty competitive. Hey Theck! Nice post as usual. Just one question: regarding DPS, do I choose Mark of Blackrock or Mark of Warsong? It doesn’t really make a lot of difference. Warsong or Thunderlord do a few hundred more DPS than Blackrock. That’s small enough for me that I’d take Blackrock, but I’m generally not trying to eke out such small DPS gains. Hey Theck, thanks for all the work you do for protection paladins, I know my warrior off tank is real jealous that no one does this much for him. I started using ask mr. robot and I’m kind of confused on the root it has me going now with HS. I only have 3 heroic T17 pieces (shoulder/helm/gloves) and my previous thinking was that is was alright to sacrifice a 680 vers/mast chest for the normal t17 to grab the set bonus while stacking haste. AMR has me picking a 680 chest and a few non haste 680 pieces and only rocking the 2 set. I’m assuming that its because AMR is trying to find a medium b/w dmg and survivability but I am not sure if i fully understand how AMR works yet. I guess my question is if the 4 set bonus is worth it sacrificing my 680 chest for a piece of normal T17. I am fairly new to your blog and I apologize if these aren’t the type of questions you are looking for here so I understand if you don’t respond. Either way thanks for all the information and keep up the great work, you’ve greatly increased my understanding of paladin tanking and I appreciate it! Last time I checked, it was worth dropping 5 ilvls in two slots to go from 2pc to 4pc. My guess is that dropping 15 ilvls in a high-value slot like the chest is right on the borderline of what’s worth doing, and may work out to be numerically inferior. Easiest way to check for sure is to sim your character twice (once with each gear set) and compare the two results directly. I just wanted to point out that your statement that with the EmpSeals buff that it’s now possible to hit the 50% haste cap in Mythic BRF gear, possibly even in an ideal set of Heroic BRF gear is an understatement. I’m hitting it and I’m in mostly Normal Highmaul gear (I’m maybe 660 ilevel, but logged out in my ret gear, so I don’t remember exactly). I actually decided to give EmpSeals a try shortly after 6.1 came out and after playing with it a bit, found that even without food I was almost exactly at the cap, I can drop I think 7 raw haste and still be capped with the raid buff and no food (and of course I realized this after I finished fishing up and cooking like 3 stacks of the 125 haste food). Another thing I wanted to mention a while ago, is that I was looking through my saved sim reports and noticed a couple of really strange things. Like really REALLY strange. As in, examples of the sim outright defying the action priority list strange. Now in all of these sims I was spec’d into SS, and they were all just standard TMI boss sims, nothing fancy, no extra bosses, no adds, etc. Yet in all of these sims, it shows Hammer of the Righteous being used 5~6 times per sim, and Flash of Light being used about once per sim. Seeing as there is only 1 enemy in the sim, it should never be used, yet it is. Seeing as I’m not spec’d into selfless healer, it should never cast this either, yet it is. Now, like I said, these are older sims, all pre-6.1 (most recent saved sim was from build 603-26), and I haven’t had the opportunity to check these out in current builds, but it still seemed odd enough to mention. Wild guess: did you change the “Player Skill” drop-down box from “Elite” to “Good”? I think that causes the player to make some random mistakes, like casting something even if the conditionals don’t match. I’ve never really used it much though, so I don’t know exactly how it works. If you’re absolutely sure you didn’t, then something is definitely amiss. But it’s got to be a bug deeper in the code than the paladin module, since those conditionals look right. If you see it again, let me know, or better yet, open an issue ticket and attach the html report. hmm….that is possible. I do sometimes change that setting down a notch, though I can’t seem to find a way to tell what that setting was from my saved reports, so I don’t know. I hadn’t even considered that that setting would do things like using an ability whose conditions weren’t met (I had thought/heard somewhere that it added a chance for the sim to skip over a line(s) in the priority list, but I assumed it still obeyed the conditions). Seems possible at least. Eventually I’ll find a day to run a new sim anyways, and I’ll check it out again. That’s my best guess anyway. If you see it happen again let me know, because that would suggest a weird bug in the conditional evaluation code (i.e. not my department, but still something I’d want to look into fixing!). Well, got off work early today, so I had time to actually use SimC again. Did several real quick sims (only 100 iterations each) with the skill setting on both expert and good and it does appear you were right. All the ones with the setting on good had both HotR and FoL being used, while all the expert sims had neither. Also, while I’m here I just wanted to express a great deal of gratitude over the addition of including scale factors for other metrics regardless of what you had the sim set for. I know that was added quite a while ago, but after doing the above quick checks, I decided it was due time to run a thorough sim of myself again, and after running an hour+ sim, I realized that I never set it to TMI. 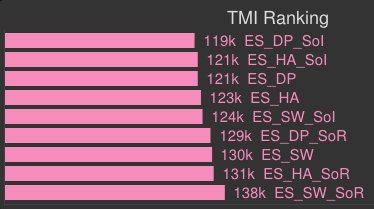 So I was very grateful that the TMI factors were still there (the normalization was a little wonky since it apparently decided to normalize against str instead of stam, but all-in-all still useful information). Hi Theck, lately I have been using EmP Seal a whole lot especially for fights like BH, but for some reason I’m still feeling plenty squishy compared to my Co-monk tank. I’m just wondering have I been doing something wrong with my rotation as well as the gearing priority? So I would drop Emp Seal, its really the worst out of them all, for BH because I care more about DPS I got Sera, that will make sure you are not squishy either having 2 active mitigation or since you have the 4 piece go DP/HS. Also you have Execution Sentence, its really not that great keeping you alive, try lights hammer if you like the 1m CD so you dont have to cast as much or use holy prism to attack boss and heal everyone pretty often, both are better for healing yourself and having to have less healing on you from the healers. I also saw you took an impaled, not sure if you did that on purpose, I know my guild does when a seige engine isnt up, also I saw other people taking those hits, that would explain why you are not getting healing because they are getting hit by that which is huge damage for dps, so they need to learn how to not get hit. Im not sure if you put your Sacred shield on someone else but you didnt have it up for a good portion, it should always be up you are constantly taking damage and want to prevent some of that. I didnt really see anything wrong with your rotation, just looked through briefly also you logged out in ret gear, cant see what you have. If you are using the strategy where tanks eat spears, I would suggest swapping out Unbreakable spirit and picking up Hand of Purity. It’s an amazing self cd for that DoT and with the added benefit of being usable on the other tank / a scrub dps if necessary. Hi Theck, any idea why there isnt any update or changes to Prot pally yet? :S I scare! In regards to downgrading to pick up set bonuses, what if it’s a single item? How many item levels should you be willing to give up in a single slot in order to pick up the 2-piece or 4-piece bonus? What are the caps of everything these days as a pally tank? Hello there, Theck. Any news? This article is interesting. Hope you got more information to share. Thanks! Btw thx for this news..